Says he: "Who did that string art?" says me: "I bought that at the thrift shop". he: "What'd you pay for it?" me: "50 Cents. It's probably the weirdest thing I've ever bought, but it reminded me of Kathy and Ken (my bro and sis). They did those. he: "I did that too". 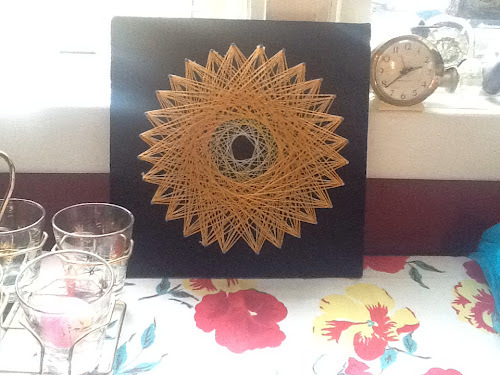 he: "It's hard to find good string art these days." I have a VIVID memory of this exact project(!) done when students at Southwood School reached Grade 6...mine was done in varying shades of blue. Sounds like a nice Friday the 13th thing to do. oh thanks for the saturday morning smile. "It's hard to find good string art these days." He's a keeper, that boy! And he can cook too! Mine still insists on saying things like, "But what is it FOR?" I did a couple of those in my younger years too! with pink and blue string. I can't remember the design though - finally just threw them away after years of storage waiting for them to come back into fashion.